OSWEGO, NY – John Spotswood of Oswego recently celebrated his 50th birthday with the usual flurry of phone calls and cards from family and friends. It wasn’t until the following day that the nuclear power plant technician opened a card from his sister and realized what a life changing experience birthdays can be. John Spotswood and Yolanda Vega share a laugh during his interview with the media Tuesday afternoon. Spotswood scratched the $5 Lottery ticket and revealed an “Autowin” coin symbol with the word “Jackpot” printed beneath – making him $1 million richer in an instant. He said he thought maybe his sister was playing a joke on him. He got the card on Friday but didn’t scratch off the tickets until Saturday. On Monday he claimed his prize. “I only have moderate success,” he added. This time, he said, he needed someone else to tell him if what he was seeing was real. The New York Lottery’s Yolanda Vega presented an over-sized prize check to Spotswood at the KTM Mini Mart, 2203 County Route 1, Oswego, as a small crowd of friends, store employees, customers and the media applauded. The prize was designed to be paid out in 20 annual installments. However, Spotswood opted to take the cash value of the annuity prize. As a result, he will receive a one-time payment of $840,000 (net: $555,912). “So, tell us John … what are you going to do with the money? What are you going to buy special for John?” Vega prompted the millionaire. He said he doesn’t have any major bills and that that he plans to save a portion of his windfall to secure his retirement. “I’ve got some time left, I just turned 50. So, I’m not going to retire right away,” he added. Other plans for the winnings include buying a new car and taking a riverboat cruise. He is still thinking about how he can thank his sister for the special birthday gift. He and his family buy Lottery scratch-offs for things like birthday and Christmas gifts, he said. “If I had won a thousand, I would have been happy,” he said. 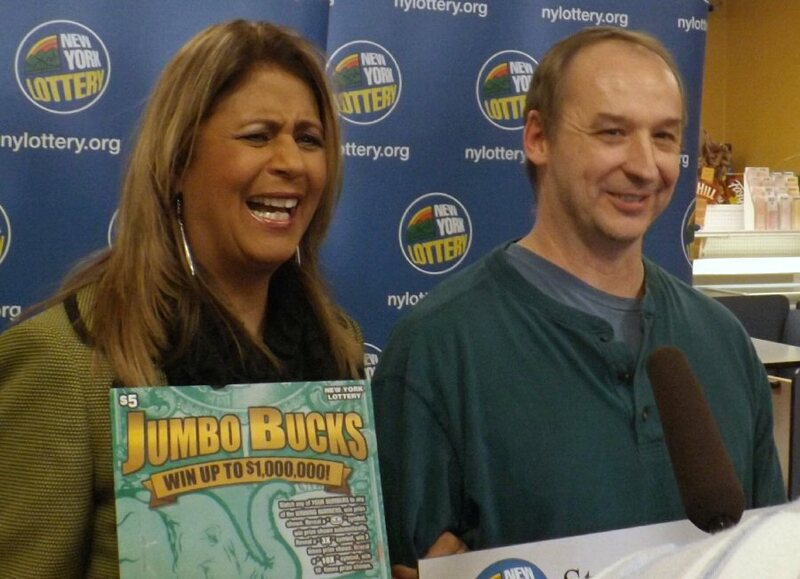 Spotswood is the 12th Oswego County player to win a top prize of $1 million or more. Other recent winners include Debra Noyes of Fulton who won $1 million on the Silver 6s scratch-off game in 2010 and Charlene Hopkins of Palermo who won $1 million on the New York Poker scratch-off game also in 2010.